Rich grass on John Wood's farm. Recently the issue arose on Facebook as to why some grassfed meat might have a strong, almost fishy smell. The opinion was expressed that the steer might have eaten wild onion or wild garlic, which are known to give a bad taste and smell to milk. Should a good grassfed farmer remove wild onion and wild garlic from their pastures? As I do not raise grassfed meat, (though I certainly cook it and eat it), I posed the question to two of the best grassfed ranchers I know: John Wood of U.S. Wellness Meats, and Chris Kerston of Chaffin Family Orchards. John qualifies because his meat is always delicious, and smells great while it is cooking and even better when it is done. Chris qualifies because his meat is also always delicious, and also smells great at all stages of cooking and eating. John has never had an issue with wild garlic or wild onions, and has not noticed them on his land. John is of the opinion that a good stand of grass usually chokes out wild garlic and wild onion. John’s pastures have some of the richest, greenest, most beautiful grass I have ever seen. John has substantially increased the density and richness of his grass by rotational grazing techniques, and by enriching the soil with ancient vegetable matter. Meat from his farm, raised on that wonderful grass, is in a class of its own, in my opinion. I have eaten a lot of John’s beef over the last six years. Chris said that what the animal eats has a huge effect on flavor. Eating a lot of wild garlic and wild onion will have a big effect on the taste and smell of the meat However, Chris is opposed to removing wild garlic and wild onion from grazing land. As Chris pointed out, removing any natural plant from a pasture will affect the natural balance, and something else will take its place. Chris stated that cattle will not eat pungent plants like wild garlic and wild onion in normal conditions. They prefer sweet grasses. Cattle will eat pungent plants for medicinal purposes, and Chris has observed his cattle treating themselves by eating certain pungent plants and grasses when they have a need. However, this is only done on a short-term basis. Also, the amount of pungent plants they eat for this purpose is in small quantities, not enough to interfere with the flavor or smell of the meat. The other situation where cattle will eat wild garlic and wild onion is when they do not have enough other suitable feed (like grass) to eat, and will eat anything out of hunger. This could certainly affect the taste and smell of the meat. I have visited Chris’s farm, and seen the beautiful rich, green grass the cattle graze on. Grazing is rotated to enrich the soil and the grass. The soil on Chris’s farm is particularly rich, and has never been sprayed with chemicals. It provides dense, sweet, green grass that the cattle love. The grass gives the cattle a deep, beefy flavor that I love. 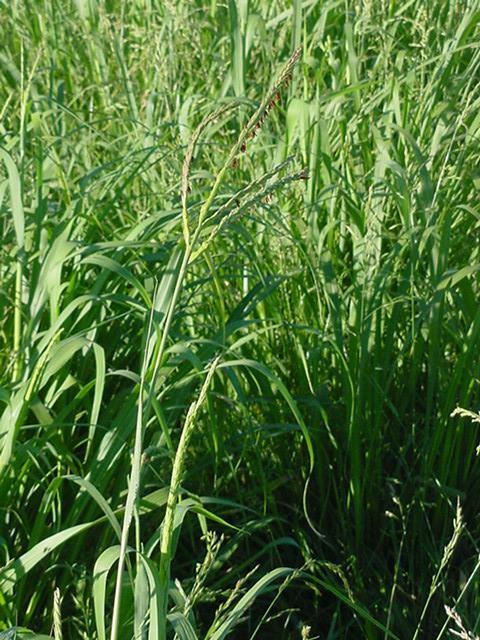 It is clear that having plenty of good sweet grass, and providing adequate pasture prevents the problem. You can buy John’s meat at U.S. Wellness Meats. Chaffin Family Orchards does not sell its meat over the Internet, but you can buy it directly from the ranch or at the farmer’s markets where Chaffin sells meat, or some buying clubs. Chaffin does sell its magnificent olive oil over the Internet. This olive oil is my absolute favorite, and my first choice for marinating meat. 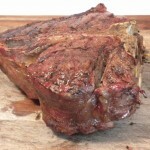 While John’s Missouri grassfed beef tastes different from the California grassfed beef raised by Chris, both tastes are wonderful, and I love to eat both of them. 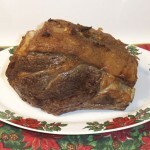 This post is part of Monday Mania and Real Food Wednesday blog carnivals.